8BitMan is an SSB4 R.O.B. and Diddy Kong player from Coral Springs, Florida, and was considered one of the best R.O.B. players in the world and the best Diddy Kong player in South Florida. 8BitMan was ranked 8th on the final South Florida Smash 4 Power Rankings and was formerly ranked 47th on the Panda Global Rankings v1. He has taken sets off of players such as Salem, Samsora, Fatality, Larry Lurr, ESAM, MVD, Ned, Zenyou, DarkShad, Konga, Mr.E, and Mew2King. In SSBB, 8BitMan was also a R.O.B. player, and was considered one of the best R.O.B. players in the United States. 8BitMan was ranked 8th on the final Florida Brawl Power Rankings and was formerly ranked 86th on the 2014 SSBBRank. In Brawl, he has taken sets off of players including Nick Riddle, ESAM, NAKAT, and True Blue. On February 10th, 2017, 8BitMan was signed by Fable eSports. 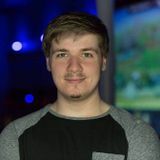 On May 22nd, 2018 8BitMan was signed by Antimatter Gaming. ↑ Fable eSports signs 8BitMan. ↑ Antimatter Gaming signs 8BitMan. This page was last edited on April 21, 2019, at 18:01.